The Spectrum Filtration Systems is a superior filtration system that handles water with a suspended solids concentration in excess of 100 mg/L and provides filtration turbidity of less than 0.1 NTU. The Spectrum Filtration Systems™ is a superior filtration system that handles water with a suspended solids concentration in excess of 100mg/L and provides filtration turbidity of less than 0.1 NTU. 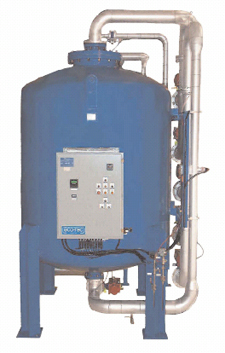 This high level of filtration performance is achieved with two layers of specialized media. An upper layer of coarse material provides depth filtration while a lower, extra fine layer removes very small particles. A combination of the two layers of media with a patented backwash process, the Spectrum Filter™ improves filtration efficiency while maintaining lower capital and operating costs compared to conventional dual media filters.